San Francisco: Hondas venerable Odyssey minivan is in its sixth year since a 1999 redesign, but Honda is apparently happy to not fix what aint broke. The Odyssey consistently scores at the top of minivan ratings, for things that matter to the families that buy them, such as safety. With a top-level five-star rating for front and side crashes, you can feel good about those trips to little league or the scouting trip. I have a family of just three, so spending a week in an Odyssey is like taking a room on the road. With 170 cubic feet of passenger volume, I feel a little greedy having it all to myself on the way to work, but for its size, the Odyssey earns respectable fuel economy. The powerful 240-horsepower engine, in conjunction with a five-speed automatic transmission, gets an EPA rating of 18 city, 25 highway while emitting minimal pollutants into the environment. The six-year-old design is aging well and still looks sharp inside and out. The edgy styling of Hondas big box is now commonplace. The chiseled face wears its chrome grille with a determined but friendly expression. The wide doors slide on both sides, allowing riders easy access to the three rows of seats. Honda created the magic disappearing third seat, which is no longer an exclusive, but it still works great. 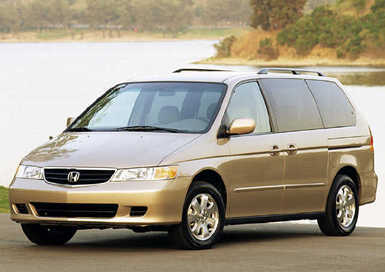 The Odyssey drives like a tall Accord sedan. I was taking a friend on a trip recently and he noticed that there was some road feel in the ride. He was expecting the completely isolated feeling of his full-sized van, but the Honda is actually fairly involving to drive. The interior fittings are, as in other modern Hondas, clean and understated. The dash panels may be hard plastic, but they look padded, and your eye quickly finds itself looking at the road and the view as you motor along. Clear instrumentation and generously proportioned knobs make operating the Odysseys controls simple and intuitive. The instrument panel area wears a matte black finish, so there is never any annoying glare. Everything is close to the driver, and mounted high enough that you dont have to search for it. Safety is important with family haulers. Besides its superior crashworthiness, the Odyssey has a standard four-wheel anti-lock braking system and load-balancing Electronic Brake Distribution to avoid crashes entirely. Dual-stage driver and front passenger airbags open with less force than the old kind. In tandem with seatbelts with load limiters and pretensioners, they ensure that youre OK even if the great brakes arent enough to get the job done. For simplicitys sake there is only one engine and transmission combination, and there are only two models, LX and EX. The LX comes well equipped, with items like power mirrors, power windows with drivers auto-down, air conditioning, cruise control, AM/FM stereo with cassette, and other handy things. The EX steps it up with power dual sliding doors, auto-off headlamps, body-colored mirrors and side moldings, an eight-way power drivers seat, a sound system with a CD player and six speakers, remote keyless entry, and a security system. If you crave even more luxury, the EX-L submodel adds heated leather seats, and offers two exciting options, a satellite navigation system or a DVD entertainment system. My Redrock Pearl test car was the EX-L with the DVD system, and I cant imagine a better way to keep your family content on a long trip to grandmas place. Because of configuration issues, you cant order both options together. Prices vary from model to model, but the LX starts at $24,490 and the EX begins at $26,990. The EX-L jumps up to $28,490, and you can add $1,500 for the hide coverings or $2,000 for the navigation system. All vehicles add a $460 destination and handling charge. Besides its many satisfied customers, the Odyssey has made plenty of friends in the auto publishing industry. The minivan won recognition from buff books such as Automobile Magazine (2003 Editors All-Star Award and Readers Choice All-Stars) and Car and Driver (5 Best Trucks three years running). Then, they charmed flinty-eyed consumer watchdogs Consumer Reports (Top Pick Minivan) and the folks at JD Power and Associates (Most Appealing Compact Van).